Keep your menu current! Menumill's powerful Menu Builder allows you to visually create your menu with drag-and-drop simplicity. Create multiple menu sections, drag items into sections to add to your menu, drag items within sections to reorder. We'll spare you all the industry buzzwords - we focused on its ease of use. 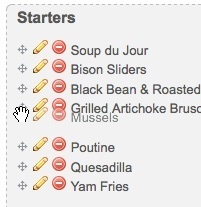 Drag an item into a section to add it to your menu. Reorder items within sections with drag-and-drop simplicity. No need to update any HTML code or call in your designer for changes. 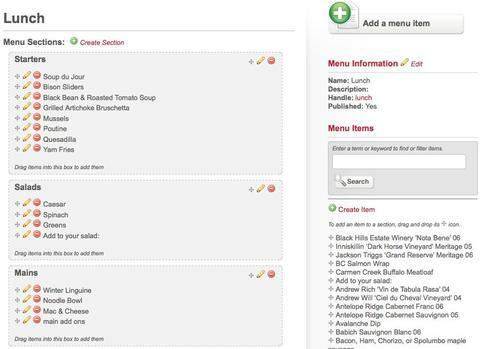 Want your Entrees to come before your Salads, drag the menu section up and call it a day.